You’ll probably get a Palm Springs canopy for your outdoor party needs. But did you know that this brand also has a patio heater that you can purchase? 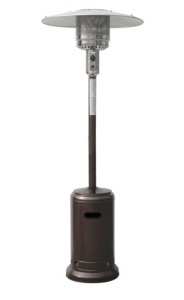 This propane patio heater comes in a hammered bronze exterior, which we’ll feature here. When it comes to features, you can say that the Palm Springs patio heater is no different than most of what we’ve featured in this review site. So the obvious question is, should you buy this heater? In this Palm Springs patio heater review, we give you our recommendation. – This is designed to heat an area of up to 115 square feet, which makes it a must-have for your night parties or outdoor activities at night. It’s also ideal for garden restaurants, as advertised. – It has a shut-off tilt valve, which comes in handy when this patio heater tips off accidentally. When this happens, the safety valve automatically shuts the unit off. – It also features an adjustable heat control (5 kw to 13 kw) to give you more control of the amount of heat this machine gives out. – It is also CSA approved and has a single stage, patio ignition process. – You’ll need a 20-lb propane tank to get it running. – It weighs 35.2 pounds and is 87 inches tall. – Stability. Not only does this patio heater have excellent maneuverability. It is also stable because of its large base. – Performance. As one consumer has said, the Palm SPrings patio heater produces heat but can diminish even in the slightest breeze. While not really that inexpensive — it can still be double the price of another propane free-standing patio heater — the Palm Springs patio heater is lighter than many of those produced by other popular brands. And if the high rating over at Amazon is any indication, this outdoor heater can compete with these popular brands as well. Overall, this heater looks nice and the heat it gives out may be better than you’d expect. But as other people have pointed out, you probably won’t enjoy the heat it generates when it’s breezy outside. Learn more about the Palm Springs patio heater here!